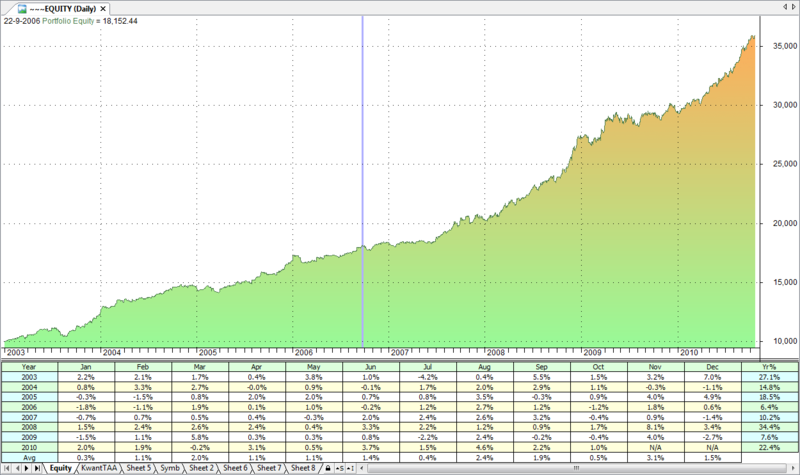 Most of my systems tend to be market-timing strategies. That is, they enter the market and usually exit within a couple of days. This has the benefit of having limited exposure in the market and during non-trading periods the capital can be used for alternative strategies/investments. However, I have noticed that even when running several strategies, I am in cash a significant moment of the time. My main worry is that during those periods, I do not generate a return on my capital. Yes, theoretically one could be getting some interest on their savings account, however as I need my cash to be ready-to-go-in at all times, I need to keep it at my IB account. And IB does not give interest on this account. So I started to play around with the thought of moving into a low risk asset class as an alternative to moving money into a savings account (which in reality I am not able to do – it takes two days to transfer money from IB to my Dutch savings account and another 2 days to get it back). Having a preference for trading ETF’s, I ended up with the idea to go long in a fixed income ETF during the times that my strategy is in cash. The ETF’s that I have selected are SHY (iShares Lehman 1-3 Year Treas.Bond), IEF (iShares Lehman 7-10 Yr Treas. Bond) and TLT (iShares Barclays 20+ Yr Treas.Bond). Add some extra logic to the custom backtest module to simulate “go-long-in-Bond-ETF” as an alternative for going in cash. The “go-long-in-ETF” position will be exited when a new trade in the EOM strategy is taken. The custom logic basically takes the cash-position at any given time and adds the daily return of the day of the selected ETF to the cash – as if one was invested in the ETF. The logic also takes into account IB tx-fees (no slippage). The logic described above is part of my standard Custom Backtest module. In this module I have implemented several functionalities, including the one described above. Recently I have made some great enhancements to it and I want to thank Frank from Engineering Returns. who has shared his CBT module. Any reader who is interested in my file, send me an email. Here are the results in a summary table for the period 1-1-2003/21-10-2003. It can be seen that being invested in a bond ETF during the periods that the system has no active position, drives additional returns and improves the annualized sharp ratio. During the investigations of this alternatives, I noticed that during first days of the month the ETF’s have a poor performance. 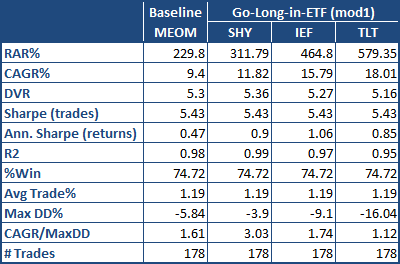 I therefore made a first modification to go-long-in-ETF when day()>2 and exit the go-long-in-ETF when a trade in EOM strategy is taken or when the day()> condition is not met. The results are in the table below. Here we can see that this mod1 further improves the annualised sharp ratio of the total returns (baseline strategy+go-long-in-ETF) for the longer term oriented ETF’s. Finally I made one last modification. Mod2 uses the RSI of the VIX as an additional filter for moving into the “go-long-in-ETF”. If RSIa(VIX,3)>70, move into real cash and do not “go-long-in-ETF”. 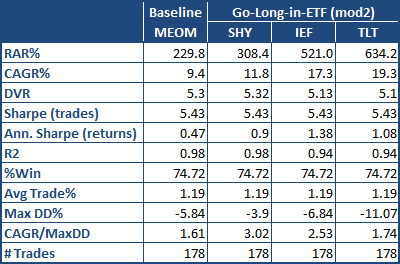 The results below show a further improvement of Ann Sharpe ratio of the longer term oriented ETFs. In summary, it seems that investing my free capital in a US treas bond ETF is more attractive then keeping it in my IB account where is does not generate any interest. I tend to prefer the mid-term ERF (IEF). 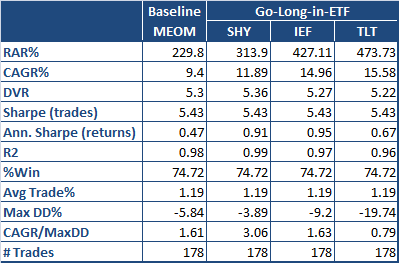 I have created an equity chart for the MEOM with mod2 “go-long-in-IEF“. I would be happy to hear your comments / suggestions! These funds have distributions each month and go ex-distribution on the first of each month, hence the poor start of month performance. Check http://us.ishares.com/product_info/fund/distributions/TLT.htm for example. Phil, thanks for your comment. In this case I need to further study how the data I use (from yahoo) takes into account these distributions and how AB is interpreting it. Phil, I just checked. Amibroker is using dividend adjusted close prices. It means that the drop in price caused by the ex-divided is `adjusted´ in my data and not present. Good question, I never tried that one. Will do an analysis later today and post the results. the longer term bond-etf you take, the more macro-economic forces you expose yourself to, no ? witness the increase in peak DD from SHY to IEF to TLT. Also, the bond market has been in a bull market for many years now so that can skew your backtest. Taking a shorter bond will keep you away from that bias. if you are considering the long bond (or some bond) as an asset class during the original rotation for MEOM, you probably should pick SHY instead of IEF and TLT. Thanks for your comments. I fully agree with them as it seems that SHY is a better pick when bringing macro-economics in the picture. As to the link, I had not seen that one before. It looks pretty similar to my approach. Thanks! I was going to make the same comment as Bgpl, ie buying T-Bills (1 or 3 month), rather than T-Notes or T-Bonds.